The Central Mass. Regional Public Health Alliance is seeking nominations for the Youth Health Action Committee. 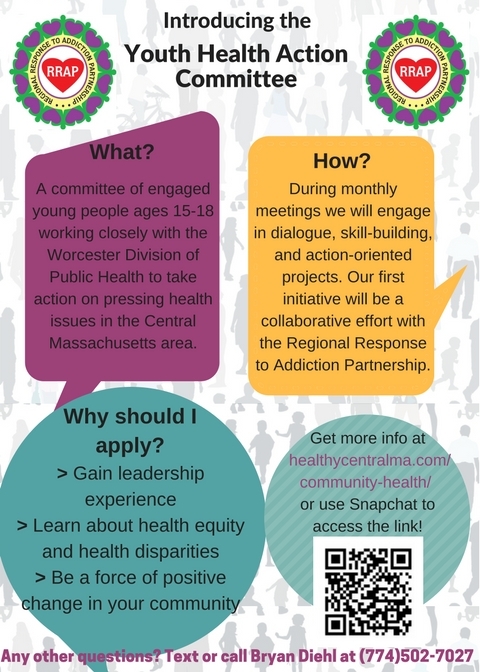 Please consider nominating a young person between the ages of 15 and 18 who you think would be an enthusiastic member of a team of young community health organizers and who lives in Worcester, Grafton, Holden, Leicester, Millbury, Shrewsbury or West Boylston. 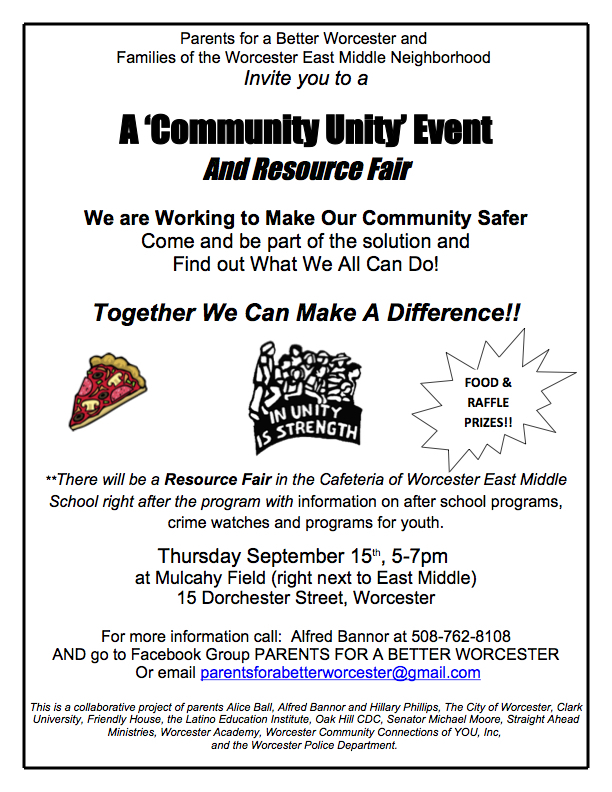 Parents for a Better Worcester and Families of the Worcester East Middle Neighborhood will hold a Community Unity event and resource fair from 5-7 p.m. Thursday at Mulcahy Field (next to East Middle School), 158 Dorchester St.
Come and be part of the solution and find out what we all can do to make the community safer! This is a collaborative project of parents Alice Ball, Alfred Bannor and Hillary Phillips; the city of Worcester; City Councilors Candy Mero-Carlson, George Russell and Kate Toomey; Clark University; Friendly House; the Latino Education Institute; Oak Hill CDC; state Sen. Michael Moore; Straight Ahead Ministries; Worcester Academy; Worcester Community Connections of YOU, Inc.; and Worcester Police Department. City Manager Edward M. Augustus Jr. and Police Chief Steven M. Sargent announced that Officer Sharon McQueen has been appointed the department’s new LGBTQ Liaison Officer. The LGBTQ liaison officer position was created in 2014 to focus on the public safety needs of the gay, lesbian, bisexual, transgender and questioning communities. The officer promotes public safety projects and programs aimed at establishing a closer, more effective dialogue between the police and the LGBTQ community, and also attends and contributes to pride-related events and programs, fostering positive relations between the LGBTQ community and the Worcester Police Department. Officer McQueen joined the Worcester Police Department in 1987. She has been involved in the LGBTQ community for more than 30 years. YOU, Inc.’s Career Pathways Program is now accepting enrollment in its Culinary Arts certificate training program. Completing the program means you’ll be certified in industry-standard practices including ServSafe, FEAST and Allergen Awareness. Students must also enroll in the YOU, Inc. Career Pathways Program at no charge. It is open to students ages 16-24 who can enroll at one of five locations in Central Mass. Registrants must have high school equivalency. HiSET classes are also available.